After finishing graduate school, I worked for nearly ten years for a big state university. One of the benefits of working for Big State was the big state retirement plan. I contributed to it every year, maxing out the matching funds the school provided to us. Basically, I saved for retirement on autopilot. It was a good thing, too. After all, my partner owns his own company, one he started right after college, and setting up a strong retirement situation hadn’t been on his radar back then, or basically ever. When we got married, we decided that I would be the one to manage and fund our retirement plan. But then I left my big university job to start my own business. While employed at Big State, I’d saved a decent amount of money in my accounts at the school. When I left, I needed to find a new way to keep saving. I had so many questions, ones that other newly self-employeds I knew seemed to share: Was an IRA the only option open to me now that I was on my own? What if I wanted to put away a lot of money pre-tax every year—more than the IRS cap on employee contributions? Was there a way to have an super-non-complicated retirement plan if I owned my own business? Because let’s be honest, if it were going to be complicated, I would likely screw something up. After I created an LLC for my consulting business, I researched my options. I needed a retirement plan that would be easy to administer—basically, that I wouldn’t have to administer—and that would allow me to put as much money away as I possibly could, ideally more than the individual IRS retirement contribution limits (2016 limit: $18,000 per year). It turned out that such a unicorn did indeed exist. It is called an Individual 401k (or an i401k or a Solo 401k). An Individual 401k, or i401k, is a 401k retirement account for microbusinesses. In order to qualify for an i401k, your company can only have one or two full-time employees: you, if there is only one full-time employee, and you and your spouse, if there are two full-time employees. If you have anyone else who works for you full time—anyone who works more than 1000 hours a year as a W-2 employee, then your business can’t have an i401k. Your business can, however, use 1099 employees—independent contractors. For more details on the employees that your business can have and maintain its qualification for an i401k, read this article. Most financial companies, such as Vanguard, Fidelity, and more, make it super easy to set up and manage—or rather, allow them to manage—an i401k. I set mine up with a big name financial services firm, rolled my Big State 401k plan into it, and started putting money in. How much money can you contribute to an i401k? The most amazing aspect of an i401k is the amount of money that you and your business can contribute to your retirement. The plan works because you, as an employee, can contribute a certain amount, and you, as the employer, can contribute a whole other amount. Together, they add up to a lot. Let’s look first at the employee’s contribution to the i401k plan. The employee’s contribution works a lot like the contribution an employee would make to any employer’s 401k plan. 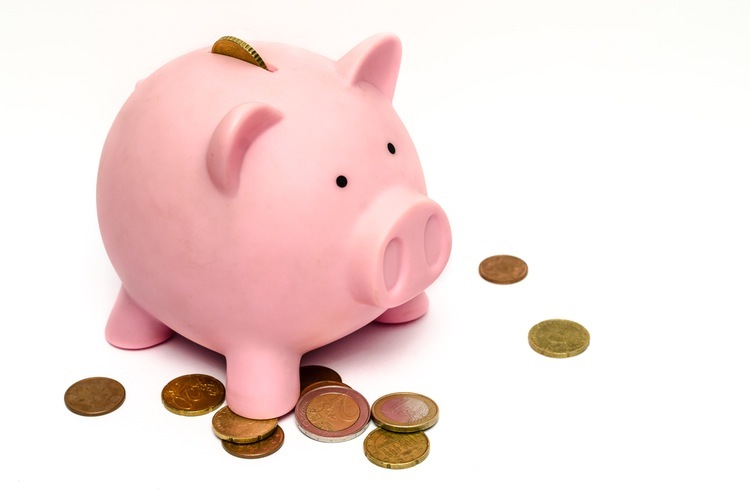 The employee’s contribution, which can be tax-deferred or Roth (i.e., contributed after-tax but grows tax-free), matches the IRS contribution limits for any employer 401k plan. For this calendar year (2016), the employee contribution limit is $18,000, plus an extra catch-up contribution of $6,000 if you’re over 50. What an i401k special, exactly, is the employer contributions. In your role of owner—that is, of employer—of your microbusiness, you can make a second contribution to your plan on behalf of yourself as employee. This employer contribution can be up to 25% of your, the employee’s, income, not to exceed $53,000. Moreover, the two contributions together—employee’s and employer’s—can’t exceed $53,000. This math can be a little complicated, and I find it easier to look at it visually. Here’s a table that shows two companies, two owners, and their contributions for this year. 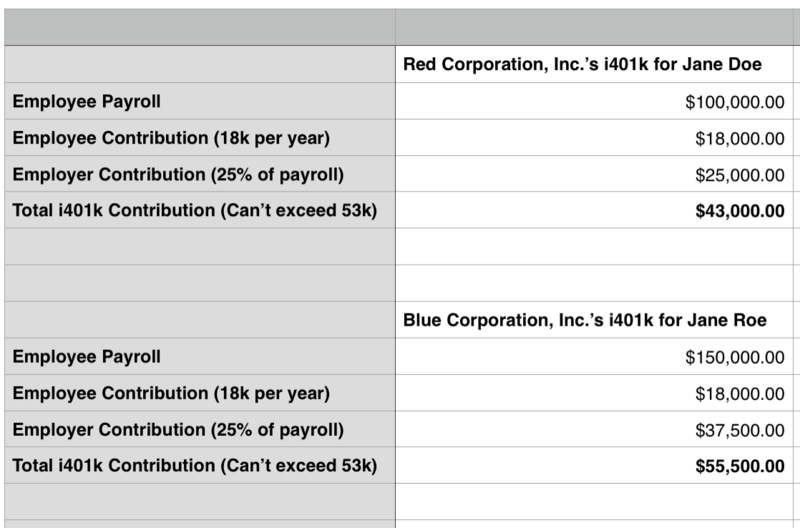 As you can see in the first example on this table, Jane Doe’s solo 401k contributions max out at $43,000 per year because her employer’s contribution is limited to 25% of her $100,000 income. In the second example, Jane Roe needs to dial back her contributions to keep her annual contribution under the $53,000 total cap. Honestly, the problems of Jane Doe and Jane Roe are not my problems right now—I can’t drop a third of my annual income into a retirement plan. But it’s nice to know that there is a retirement plan available to microbusinesses that has this kind of flexibility. One last note on solo 401(k)s: you have until December 31, or the end of the fiscal year, of the year that you incorporate.